Almar will delight you every morning with its extensive breakfast buffet, served by the crystal-clear swimming pool in the warm and sunny summer mornings or inside the bright room that overlooks the outdoor terrace through large windows, tastefully decorated with elegant shades of white and dove-grey. A profusion of fragrant smells, the familiar taste of home-made cakes, the inviting appeal of the best Italian meats and cheeses, a wide selection of juices and drinks and the aroma of espresso coffee… breakfast is a pure moment of pleasure, to be enjoyed in peace and quiet. Alternatively, to relish a unique and cosmopolitan experience from early morning, Almar invites you to discover new flavors and new cultures with the new breakfast menu set – available for a surcharge – to start the day experimenting or rediscovering the flavors of Japanese, Russian or Chinese breakfasts. Imagination, a creative spirit and the charm of distant cultures are the elements that inspire our Breakfast Menu Sets. A sensory and culinary journey through the traditions and local specialties of fascinating countries. Finding the time to indulge in a culinary craving is often difficult in every day life; that is why Almar provides you with a feast of flavors to choose from that will give you the opportunity to pamper yourself with your favorite dish or to try out a new recipe. Featuring many dishes with international flair revisited by our Chef, our Breakfast à la Carte captures the palate with its flavors. Upon waking, delight your taste buds with porridge, bagels with salmon and cream cheese or with peanut butter and banana or opt for a pancakes Millefeuille with strawberries, banana or ricotta, or French Toasts. 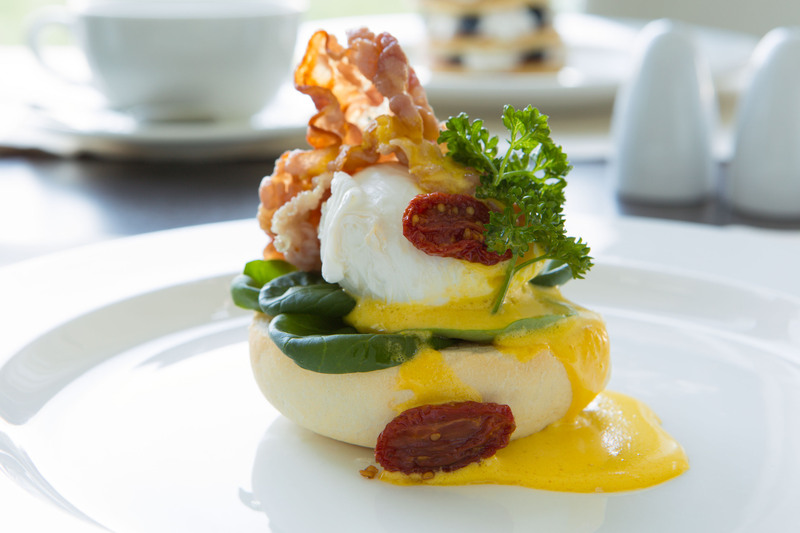 Our selection also includes the famous Eggs Benedict, Eggs Hemingway, Eggs Florentine or our vegetarian option of Veggy Eggs Benedict with Radicchio. The à la Carte selection is available for an additional charge. Japanese cuisine is renowned worldwide for its dishes such as sushi, tempura or sukiyaki, however, it is quite unusual to have the opportunity to try traditional breakfast fares of this extraordinary gastronomic culture. Almar offers a unique menu set for a journey through the flavors and aromas of the Orient. The breakfast menu set offers Japanese-style miso soup, steamed rice and soy sauce, slice of grilled salmon, filet of smoked harangue, boiled egg, tofu salad, cucumbers and Fuji apples, pickled vegetables and is accompanied by mandarin juice and green tea. Forget cappuccino, bacon or croissants … and allow yourself to be transported into a charming oriental atmosphere with our breakfast menu set Chinese-style. Chinese food is incredibly filling and therefore suitable for breakfast, low in sugar and exceptionally fresh. The Chinese breakfast menu set will lead you along an imaginary wall with eggs poached in black tea, Congee – traditional Chinese rice soup -, steamed dumplings, ginger petals, a selection of kumquat, persimmon, lychees and pomelo jams. The drinks include black tea and kumquat juice, the fruit known as Chinese mandarin. High Protein and accompanied by drinks such as green tea with milk, milk Kefir – with a taste similar to yogurt – and tomato juice, breakfast is filled with the colors and scents of Russia. Iconic products served with the style of this nation. The culinary journey begins with butter Pelmeni – pasta pockets stuffed with boiled ground beef and onions – and Syrniky with raspberry sauce, better known as tvorog pancakes. It continues with a fried egg on roesti of onions and potatoes, and finishes with a pancake and ricotta millefeuille.